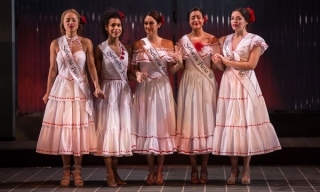 Another Word for Beauty, by José Rivera, debuted at the Goodman Theatre on Monday to a roaring crowd who were on their feet after witnessing a powerful performance about female inmates at a Colombian prison participating in a yearly beauty pageant. Throughout hypnotic dances and memorable tunes, Another Word for Beauty redefines what the meaning of beauty is and how it is within ourselves to define it. Two artists from Another Word for Beauty, Danaya Esperanza and Carmen Zilles spoke to Lawndale Bilingual Newspaper about their characters and the message they hope resonates with the audience. Danaya Esperanza plays Luzmery. 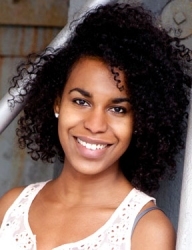 Esperanza’s off-Broadway credits include Men On Boats (Clubbed Thumb), Washeteria (Soho Repertory Theatre), and Our Lady of Kibeho (Signature Theatre). Esperanza graduated from The Juilliard School. What element of the play drew you to Another Word for Beauty? The countless manifestations of inner beauty; the relationships that these women have, the community they build together; and more than anything, the incredible space for change that is created through sharing and storytelling. The play touches upon several themes, whether it be injustice, rebellion, resiliency, womanhood, etc., what theme resonated with you the most and why? The theme that resonates most for me is transformation. Throughout the very literal, physical transformations that happen in the pageant, deeper seeds of transformation are planted. The questions that I am always left with are, will those seeds grow and what will nurture them after this pageant ends? Based off your experience working on Another Word for Beauty how would you define the term “beauty”? Beauty is truth. Raw, unfiltered, bleeding truth. What do you hope the audience takes away after viewing Another Word for Beauty? I hope the audience walks away with questions and the hunger to learn more — about systems of “justice” in Colombia and in the US; about programs that empower and help to rehabilitate incarcerated women and men (see #2 above); about understanding and compassion and how much of those we actually allow ourselves. Carmen Zilles plays Isabelle. Zilles received her MFA from the Yale School of Drama. Her credits include Ivo van Hove’s adaptation of Ingmar Bergman’s Scenes from a Marriage (New York Theatre Workshop), Octavio Solis’ Se Llama Cristine and José Rivera’s Adoration of the Old Woman (INTAR Theatre), to name a few. I wanted to work on a play with a group of women. I was intrigued by a play that touched on the different ways women identify themselves, and tell the stories of their lives. I was interested in the idea of personal transformation, which I think is a universal theme. In this case, it’s specifically how the acts of both telling their stories and competing in a pageant give the women opportunities to transform their ideas of themselves. That directly parallels what I’m doing as an actor in this production: transforming my idea of myself by performing in this play. It’s an interesting human experiment. I’d say womanhood. That’s definitely a huge component of all of Jose Rivera’s plays, because he loves women so much. I think he really believes every woman is incredibly beautiful in her own particular way. I look around at my cast mates and feel that all the time. I guess I have also been asking myself a lot of questions about the fine line between objectifying beauty and appreciating it. I’ve also been asking myself questions about the prison system in this country, in Colombia, about prison systems in general. They’re complicated issues that the play addresses but that it can’t possibly supply answers to. I think they’re worthwhile conversations to begin, though. Based off your experience working on Another Word for Beauty how would you define the term “beauty’? I’d say beauty for me is vibrancy. It’s feeling alive, feeling like you’re vibrating with the other people and things in your life. It has to do with appreciating your individual life and its circumstances, rather than wishing for or waiting for an ideal. I think the women in the prison find ways to appreciate life and find freedom despite their imprisonment, the trauma of their pasts, and the monotony of their everyday lives. That’s really beautiful. I hope they’re entertained. I hope they feel some similarities to some of the people whose stories they see onstage, even if the immediate circumstances feel completely different. I hope they have questions about the things the plays stirs up. I hope they feel connected to us and to humanity, in a larger sense. I just want to feel that we’ve touched people for a moment with something truthful that comes from our hearts, as cheesy as that might sound. We try to give of ourselves in order to give the audience something valuable, even if it’s a fleeting or an intangible thing. Another Word for Beauty runs through February at the Goodman Theatre located at 170 N. Dearborn Street. For more information, visit www.goodmantheatre.org or call 312-443-3800.